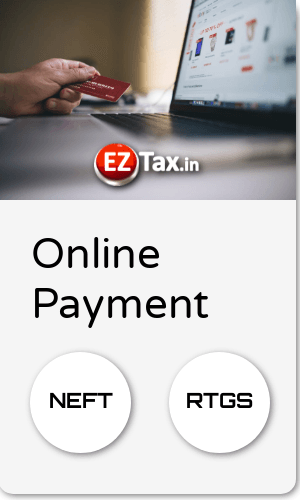 How to pay Income Tax due Online in India? Detailed step-by-step instructions on how to make a payment thru NSDL authorised site? Now Paying your Income Tax Return (ITR) Due Online thru self assessment Challan 280 is easy, and takes just few moments to complete. 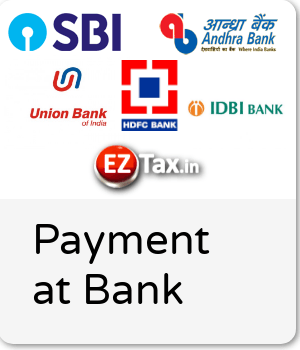 you can also do this at the time of income tax preparation / filing at EZTax.in portal. If you owe tax for the assessment year for which you are filing or filed thru EZTax, the amount of tax you owe will be displayed on the eFile / Creative Audit screen. There are two options to Pay your income tax due. In both the cases, use Challan Number / ITNS 280 to fill the details and pay the tax. Click on Challan 280: (at the bottom of the page). Go to the non-TDS / TCS Section and click on "Challan No. / ITINS 280" for the payment of Income Tax & Corporation Tax. Follow the below instructions to get the payment processed. Tax Applicable: Select (0021)INCOME-TAX (OTHER THAN COMPANIES), as is the case for all individual tax payers. Enter PAN number and Assessment Year as per your Tax Return. Type of Payment: Depending upon requirement, choose (300) SELF ASSESSMENT TAX or (100) ADVANCE TAX. Bank Name: Select your Bank Name from which you would like to make a payment. Submit the Data: On submission of data entered a confirmation screen will be displayed. If the taxpayer confirms the data entered in the challan, it will be directed to the net-banking site of the bank. Login to NetBanking Site: The taxpayer will login to the net-banking site with the user id/ password provided by the bank for net-banking purpose and enter payment details at the bank site. Collect the Receipt: On successful payment a challan counterfoil will be displayed containing CIN, payment details and bank name through which e-payment has been made. This counterfoil is proof of payment being made. After payment, most of the bank sites download a PDF; please save this file for future use and the same need to be used while completing your IT Return. If you lose this for some reason, you may get it in the income tax e-filing portal but it may take up to 24 hrs. Speak to us if needed. Prepare: Prepare the data needed for Challan 280 and go to the bank branch to pay. Receipt: Keep the Challan Receipt and use the information to enter to complete your Tax Return. In both the cases, consider keeping the challan receipt for future use ... the refund from ITD may take time, until it's fully processed, it's your interest to keep the receipt as a proof of payment.